Nearby Explorer is a full featured GPS app designed for use by people who are blind. Instead of just providing directions, it describes the environment in ways comparable to reading signage or observing road characteristics. 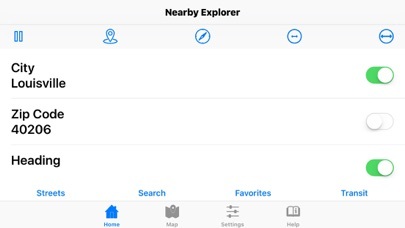 It uses onboard maps, so a data connection is not required, but if you have one, Nearby Explorer supplements the on board map data with crowd collected locations from Foursquare or Google Places. It includes complete maps for the United States and Canada which contain millions of points of interest. The onboard maps are over 4GB in size, so be sure the device you plan to use has enough available space before purchasing. 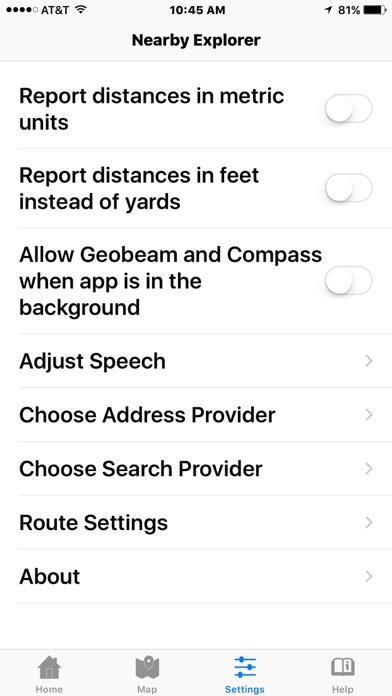 Nearby Explorer works with any device running iOS version 9 or later, but if the device does not contain its own GPS receiver, like most iPads and iPods, you must use an external GPS receiver. 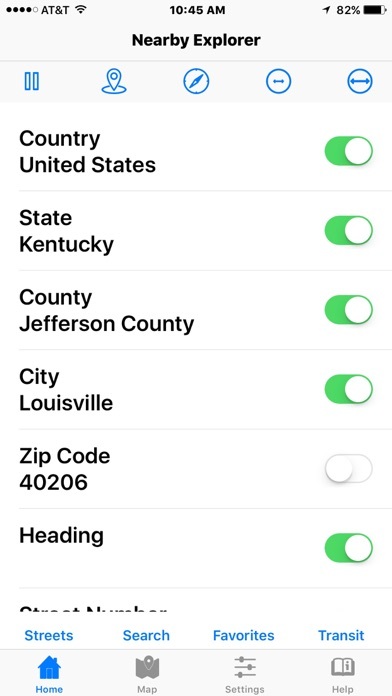 All iPhones contain GPS receivers. Nearby Explorer works by letting you select from several different location related options about what to announce as you move. These include both typical items like street name and address and specialized options like approaching streets, intersection configurations, and nearby places and the distance and direction to them. (All announcements are optional.) All of this information is shown on the home screen and is available at any time, but typical use is to adjust the level of announcements, then lock the screen and put the device away. This keeps both hands free and let's your preferred voice speak the characteristics of the environment as you move. You may also use the devices position and orientation to obtain additional targeted details such as pointing the end of the device to scan for businesses, even in a moving vehicle, or tilting it vertically to function as a compass, including a listing of streets in the indicated direction. This all works with the device locked, so one need not fuss with the touch screen while moving. You may even mark a point, then use the position of the device to get haptic feedback about that point's location. Nearby Explorer includes a transit feature that provides detailed mass transit schedules for over 60 metropolitan areas in the U. S. and Canada. It treats transit stops just like favorites and points of interest by announcing their name and relative position as you move, but in addition, transit stops add next vehicle stop time, direction of travel, and route name to the announcements. You can use the transit schedules to look up times or even follow a route. You may virtually move to any area in the U.S. or Canada and explore the road network, search, or use the transit maps for that area. For complete details about Nearby Explorer, see http://tech.aph.org/ne Continued use of GPS running in the background can dramatically decrease battery life. This app is extremely useful! It has saved me from sighted assistance countless times. Thank you APH! This GPS system is easy to use and very complete. I would highly recommend it to anyone, especially those of us who cannot see well. 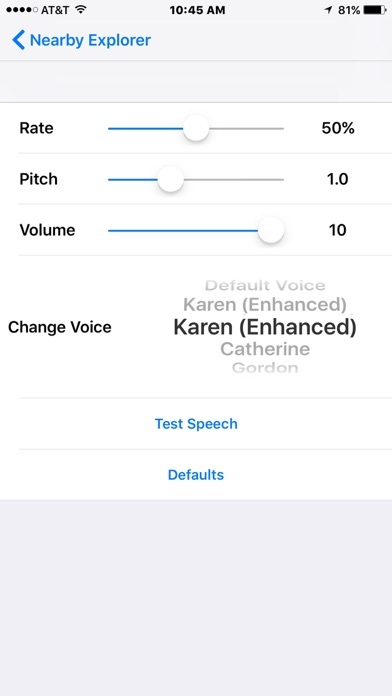 It works very well with voiceover. This is the best, gps app, for all, blind people. It is outstanding!!! I love this app. An so does everyone that I know use the app.... Its better , than every gps app.. I mean every app... gps, app, for blind persons. Please, keep the updates, coming. I have the paid, one..... An its well worth, the price, and some. Nagged for a rating even though my iCloud setting is off. Here’s the rating they were willing to ignore my settings to demand. Can be helpful at times, cannot depend on its accuracy. This app gives me more information than any other GPS app I have tried. But app has some oddities such as action menus with only one choice, which then must be used to take you to a secondary screen of controls. One of these secondary screens (for favorites) has a choice for adding a favorite, but it doesn't use the current position as expected, but uses the position which existed when you first entered the screen (which could be quite different from the expected current position). The user manual/guide is definitely on the minimal side, and there's no support except a community mailing list. and no published policy on when (if ever) customers will receive map updates. Maps require over 2gb of storage on the phone ... good if you lose your data connection or are pinching every penny used for your data plan ... bad if you'd like constantly updated maps (or indications of temporary blockages). Cleverly, the app does allow you to point with the phone in various positions to find out what's in the indicated direction. (Streets, points of interest, or a specifically "watched" location can each be determined by the way you hold the phone when pointing).